So the hurricane passed, lights came on so I thought I needed to pass on this advice to all of you… I spoke with a Dad just before the storm hit. He took a deep breath and thanked me for reminding him to enjoy the moment rather than stressing about what he was missing at work. The lesson is not to wait for a natural disaster to stop and turn off the technology – just make a date with your family. Turn the lights off and create a new tradition, new fun and special family memories for your kids. While vacationing on a beach this past January, we met a rather charming, precocious 4 year old named Piper. She obviously observed several people selling their wares on the beach. She and her much older (all of 6 years old) cousin, who provided moral support, cautiously approached us with a pile of small pictures she had created. 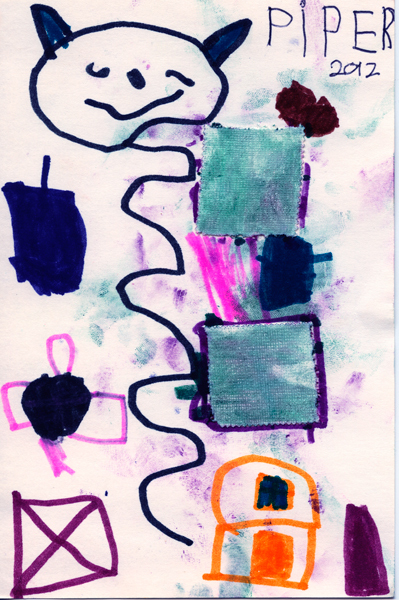 We browsed through her collection while she informed us she was selling her art. My husband and I had to control our laughter because it was so bold and earnest. We just LOVED it! I asked “so, when were these masterpieces created?” Piper looked at us with her big blue eyes and answered: “This morning!” We asked the prices of her fine art and she responded “Oh, 10¢ a picture.” So, I picked one picture and asked her to sign and date it. Piper could only write her name, so we dated it. We gave her a $1 to further motivate her entrepreneurial spirit. Besides, we were not sure how much more successful she would be… We enjoyed giving her a good start. By the way, her parents were close by, enjoying the moment and laughing with us. I am hanging this wonderful picture in my office to be cherished. If she can navigate this scenario, I can’t wait to see what’s next. Meg Cox wrote a wonderful book called The Heart of a Family where she explored how rituals anchor us to our roots, provide honor and stability in the lives of children. And they can be inexpensive and uniquely yours! These are some ideas that come from this author as well as from friends. But you’ll have to find what your think resonates with your tribe and make it your own…and then repeat each year! § One family uses February 14th to have Red Food Night. Only red food can be served…think red sauce, tinted mashed potatoes, beets, strawberries, pink lemonade, ham??? Desserts are easier, but the children in the Straw household looks forward to innovative main course features. § In the Chesto family, mom tries to “characterize” each child in a way that celebrates that child’s strengths. So she bakes a heart-shaped cake, frosts it red or pink, then writes a word for each of her three children (justice, courage, forthright). Then her kids debate and guess which word mom intended for each of them! She says the conversations have been great. § One family started a Valentine-Validation book for each child. Every year the parents add a page or two to the book. Mom and dad start secretly compiling a list in late January and then write a few statements. “We love you because ____________”. They found that their children’s books chronicle their lives and their development. § Dee Ann prepares “high tea” for her children after school on Valentine’s Day. Pink milk in the precious china, pink cream cheese-heart shaped tea sandwiches and all! Funny pretend-English accents are required for tea conversation. § Dad in the Kerry family always buys each of his daughters a box of chocolates. When they awaken on Valentine’s morning, their box has a love note from dad followed by their once a year Chocolate Breakfast! What family activities or “rituals” can you establish to focus on each child’s unique strengths? Have fun! Celebrate! I am about to embark on my 31st annual International Toy Fair. Honestly, I can’t believe it! So just as you are making pink cupcakes and filling out sweet Valentines’ cards with your kiddos, I am actively hunting down what I hope to be the best of the best toys for your families to enjoy all year long. I am also searching for our top picks that can be part of our 2012 holiday catalog. So many people think I might be jaded, indifferent or simply downright bored after all these years. ABSOLUTELY NOT!!!!! I still walk the aisles with a spring in my step. I still get totally jazzed by all of the exciting new products. I continue to be passionate about empowering children and families to embrace their love for play. We are dedicated to finding high quality playthings that will inspire healthy, creative play. So, I have already begun the journey as the International Toy Fair renews the motion for the year to come. Thousands of vendors will be there; both old and new. It is an ongoing challenge and inspiration to make all of you happy with new exciting products for 2012. Thank you so much Debbie Gardner, Assistant Managing Editor, from the Reminder for doing such a wonderful article about us! LONGMEADOW, MA — There’s a poster on the door of Kiddly Winks owner Joy Leavitt’s office that shows a drawing of a woman with children popping out of her hair. “That’s me. That’s always been me,” this former preschool and grade school teacher-turned entrepreneur told Reminder Publications. It was the desire to play with her own children that Leavitt said led her into the toy business in the first place. In the early 1980s, frustrated with the selection of toys found locally, she and a friend, Elaine Weiner, started searching out what they considered better playthings. They also began sharing what they discovered with other mothers. Within five years, her inventory had outgrown her basement and Leavitt said she “needed to go retail.” Her first store was “a 750-square-foot space … filled to the gills with toys” located where Escentials is at Williams Place on Williams Street. As soon as she was able to add more space, Leavitt added books to her store’s offerings. 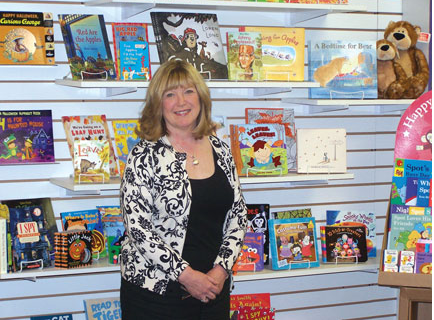 Her Longmeadow store now dedicates a full quarter of its space to an extensive selection of children’s and young adult books and Leavitt said she even carries a selection of the high school’s summer reading list titles every year. “The kids come here for their summer reading books,” she said. In the early 1990s, the two stores combined in the current, spacious location at Williams Place. In 1998 she opened a second location at Bishop’s Corner in West Hartford, Conn., and in 2003, a third in Canton, Conn.
Leavitt said the West Hartford store closed last year after 12 years in business, but not for economic reasons. “Our lease was up, and the building was falling apart. It was just time to be out of that space,” Leavitt said. “We had a great run, and a lot of our clients still shop at Canton” — a larger location she said is “just seven miles down the road” from the Bishop’s Corner store. She said the way people shop for toys has also changed, thanks in part to the Internet, and she recently redesigned the store’s Web site – adding a personal blog — to keep up with the market shift. “We get a lot more inquiries by phone and email than we did before,” she said, adding that shipments “all over the country” are increasing. But she and her staff are finding that, despite the ease of Internet shopping, clients are still looking for the local toy store experience. “They want to walk in and look and touch; they want personal attention; they want their gifts wrapped beautifully. I love that people still want a neighborhood store that children can grow up in,” Leavitt said. Leavitt praises her staff — “there are 30 people who work at Kiddly Winks between the warehouse, the Internet and the two stores” — and her husband, Michael, who has been her partner for the past 12 years, for the continued success of her business. She also credits the emphasis she’s put on in-store events, such as Groovy Girls nights, Lego days, Arthur and Madeline costume nights, the store’s annual Art show of works by local children and author book signings as ways Kiddly Winks has continued to bring parents and children together — and into the store — for fun over the years. Upcoming events at Kiddly winks include an anniversary sale Sept. 23 to 26, in-store silhouette portraiture Oct, 7 and 8, an adults-only talk on “Play in the Lives of Children” with Deb McCollister, founding member of the American Specialty Toy Retailers Association on Oct. 12, and a book signing with author Anna Dewdney on Oct. 23. Thank you, again, to the Reminder! See the rest of the article on The Reminder website! Two Charm It!! Design Contest Winners! We are so proud, honored and excited to have 2 winners from The Charm It! Design Your Own Charm Contest! Abigayle P., age 11, from East Longmeadow, MA created an adorable horse charm. 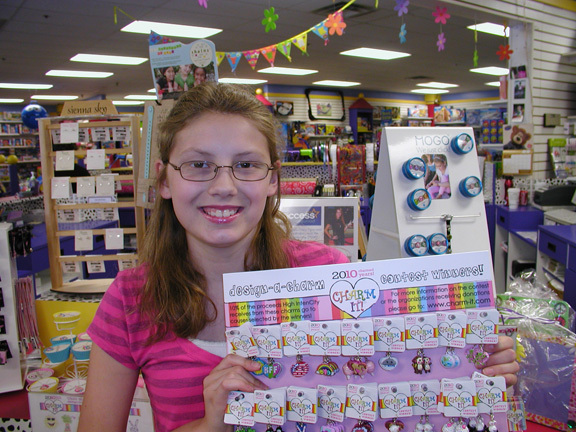 And Madison M., age 9, from West Hartford, CT designed a precious turtle charm. Charm It! Design Contest Winner Number Two! I think we have future designers in the making! All the entries were wonderful – we had over 100 girls that participated! And we were thrilled to find out that Charm It!! selected our kiddos. The girls were each given a fabulous goody bag from Charm It! and 10% of the proceeds will be donated to each of the girls’ favorite charity. How awesome is that!!!! To both Abigayle and Madison – a big congratulations from all your friends at Kiddly Winks!! West Hartford Girl Wins CHARM IT! Design Contest!! We’re sooooo excited to share with you the article below from the Hartford Courant about a wonderful young woman from West Hartford, CT who WON the CHARM IT! Design Contest!! Winner Madison Mandyck’s charm design was one of 36 selected from thousands of entries from across the entire country! The CHARM IT! “What Charms You?” Collection is available at specialty retailers nationwide and local retailer, Kiddly Winks. To learn more about the CHARM IT! Design-A-Charm Contest, the local winner and her charm visit www.highintencity.com. “What Charms You?” was the question High IntenCity posed to girls across America through a nationwide CHARM IT! Design-A-Charm Contest hosted late fall 2009. Girls were invited to design a charm with the possibility of seeing that charm come to life in the “What Charms You” collection. Winners have been chosen, 36 trend-savvy talents to be exact can claim bragging rights as CHARM IT! designers. Not only will the contest winners’ charms launch in the new collection, but the 36 chosen will also receive a goody bag filled to the brim with CHARM IT!. To top it all off, High IntenCity will donate 10 percent of its proceeds from the contest charms to causes nearest and dearest to the winners’ hearts. Madison’s winning charm will help animals through the World Wildlife Fund. In honor of CHARM IT’s 10 year anniversary, the “What Charms You” collection debuts at specialty boutiques nationwide, including local retailer Kiddly Winks, and will be at girls’ fingertips July 2010. Charmed by an overwhelming response of entries, High IntenCity was thrilled with the fun and rewarding challenge of choosing the 36 winners from tons of in-store, mail and on-line submissions. The High IntenCity team was abuzz during the companywide vote and blown away by the talent and creativity of designs that represented what is most meaningful to girls today. The winning styles celebrate the themes that girls across the country know and love, from world peace, save the animals, and other messages of positivity to out-of-the-box creations like a talking taco and a giant smile full of braces. Submitted by Jackie Blauvelt, High IntenCity , on 2010-07-20.